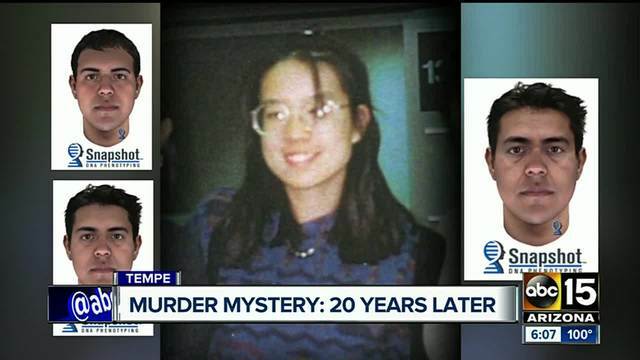 On August 7, 1997, a man entered Fiona Yu's apartment in Tempe, Arizona. Once inside he sexually assaulted and strangled Fiona to death. Around this time, investigators were looking into another sexual assault in the local area that might have also been committed by Fiona's killer. The above sketches were provided as a result of DNA phenotyping, to give an approximate physical look of the killer. The approximate description is of a Hispanic male, with light brown skin. He is believed to have black hair, brown eyes and now believed to be 45 years of age. Based on investigating agencies, it is advised to contact Silent Witness at 480-WITNESS if you have any information on Fiona Yu's unsolved murder. Thoughts? I really do hope that DNA phenotyping can lead to an arrest soon in one of these cold cases that we've posted about here on the forum. It should be noted that the killer's appearance may differ slightly in some sort of fashion and the above depiction is not 100% accurate.